Commercial hood cleaning helps Newark commercial kitchens reduce the severity of grease fires if a fire should occur. 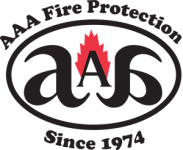 At AAA Fire Protection Services we understand fire suppression and fire prevention in commercial kitchens. With over 40 years of experience, we bring a high level of expertise to every client we serve. Our comprehensive set of commercial kitchen services includes the installation and care of restaurant hood fire systems, thorough sanitary restaurant exhaust cleaning, and a comprehensive grease filter exchange service, which helps commercial kitchens like yours remain compliant with UL300. We start with the maintenance or the installation of kitchen hood systems. UL300 requires one extinguishing nozzle for every appliance and up to three nozzles, on a 12 burner stove. Understanding the code helps us work efficiently and to keep our prices affordable. We also understand that grease exhaust cleaning needs to occur twice per calendar year and by a professional cleaning company. Grease in the exhaust system of commercial kitchens is what causes small kitchen fires to turn into total loss catastrophes. To help keep grease out of the ductwork our grease filter exchange services replaces faulty exhaust hood filters with UL 300 compliant grease hood filters that are - baffle style 18-gauge galvanized units. To learn more about working with us, or how we might service your kitchen, just give us a call at (800) 543-5556.